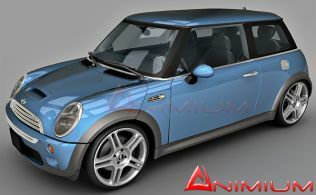 Toy car is a Reactor component in 3dsmax which can be used to animate a car in a realistic way. 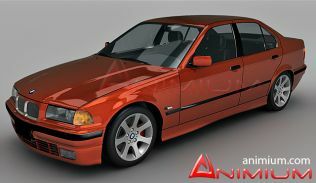 In this tutorial we will be animating a car with 3dsmax Reactor's Toy car. 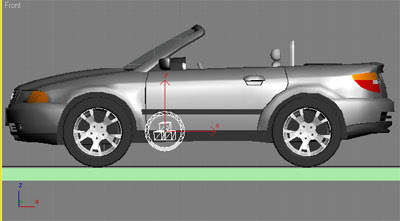 3d model of a car is provided, which we will be using in the tutorial. The car is grouped in such a way that the car body, interior all grouped into one object and the four wheels as separate objects. Next select all the four wheels and open the reactor's property editor again and set the Mass value to 5 and select Mesh Convex Hull. Now select the box (ground object) and set the Mass value to 0(zero) and select Bounding Box, in reactor's Property Editor. Now all the properties were set, but we haven't created a rigid body collection, which is the main component of 3dsmax reactor, used in calculating the simulation. To create the rigid body collection select all the objects (car body, wheels and the box) and select reactor -> Create Object -> Rigid Body Collection. Now select reactor -> Create Object -> Toy Car and place it in any viewport. 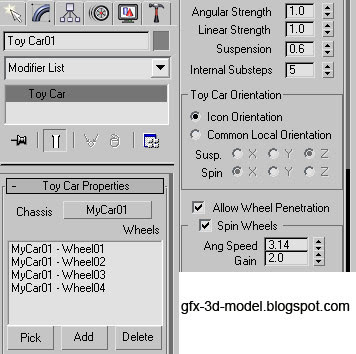 Now go to the Modify Panel, under Toy Car Properties click on the button labelled none for chassis and select Mycar01 (car body). Then click Add and select all the four wheels. you must have the following objects assigned as shown in the pic. Also check the following parameters. Most of them were default values. Now you align the Toy car Icon in such a way that the arrow points forward. 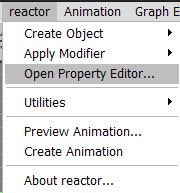 Now go to the Utility panel, select Reactor, under Preview Animation click on Create Animation Button. This will create Keyframes for your animation. 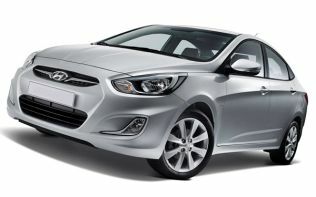 If car moves slowly try to increase the Ang Speed and Gain values in Toy Car panel.